I don't post recipes much bcos I always follow people's recipes and cooking. After reading Jamy's posts in Seay's kopitiam, I realised that using oven to cook is a lot easier than the Asian type of cooking, where you need to be there all the times stirring or frying. 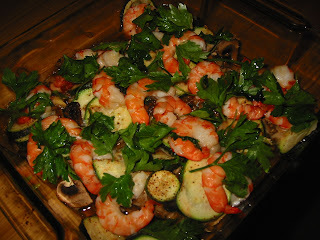 So here's the tiger prawn and vegetables I made yesterday. In France people buy the shrimps cooked, so I usually buy frozen tiger prawns, especially those raised in Malaysia. I bought two boxes of them and the cashier reminded me to get the third one for free. Cool people here. I think you can get the green curry paste from any of the Asian store, either in the area close to the Chinatown Restaurant, or Asian Caraibes at tramway ligne 3 beausejour. I have seen a recipe book about curry in the Mediatheque library, there might have recipe to teach you how to make curry paste from scratch. This looks like an easy to cook and healthy meal. BE, it looks very nice. Yes, cook with oven is much easy. Some tips for oven so u don't have to clean a lot, used aluminum foils, fold it all the way up the edges so the juice will not dirty the pan. Use olive oil, and lots of herbs to make it nicer. If u want Asian style for meat, use soy sauce, oyster sauce , honey and some sugar. thanks a lot, found it! just need to try it now !